Last weekend I had the very great pleasure of attending my first ever Blue Light Camp. I’ve done a few unconference events now so I had a good idea how it was going to work, but this time I was there specifically to help with links to open data tools and techniques. What struck me about these two days is just how good the emergency services already are at co-operating and sharing information between themselves to manage incidents, and how open they are to the idea of sharing some datasets to see what can be done with them. Among the sessions I joined was one about ‘Listing the Datasets’ – the idea being that with the right people in the room we could brainstorm a list of all the data that would be needed in a major incident, and work out whether any of it could be published openly as a matter of course. The big goal here is to see whether we can have all the right data brought together in a way that gives the right intelligence to the right people as quickly as possible when time is tight and people are in danger. 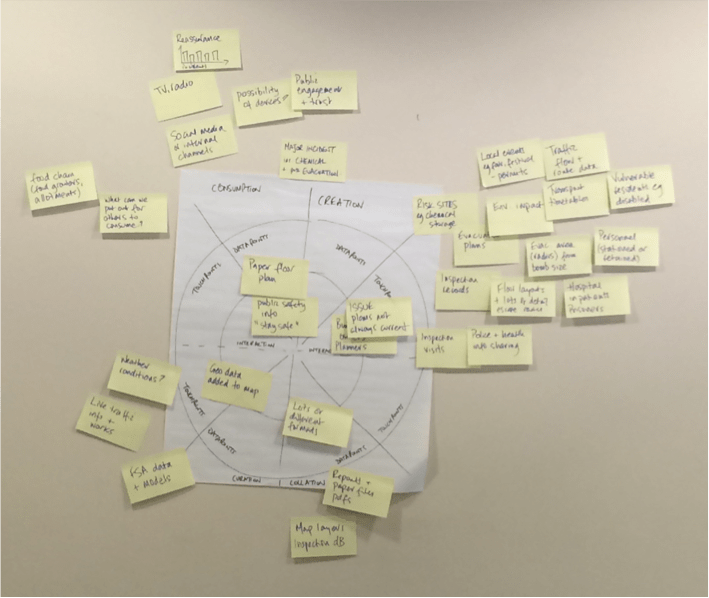 A few months ago, at a GovJam, my colleague Simon Gough came up with this framework for designing a service with data – the Data Loop – and although I’ve seen it used a couple of times this was the first opportunity I’d had to try it out in a totally new environment with people I’d mostly never met before, and a data ecosystem I didn’t know. Too good a chance to pass up, right? If you download the instructions here – http://redfront.co.uk/blog/the-data-loop/ – you’ll see there’s a whole guidance document on the process you use to work with this, but actually it’s really simple both to explain and to do. It works like this: you start at the top, work clockwise, and for each quadrant you think about how data comes in and goes out of your area of work. This can mean your whole organisation, if you collect data from customers, or it can be about your team if you are managing data flow between departments; or it can be just about you and how you give and receive data on your own server, PC or mobile device. 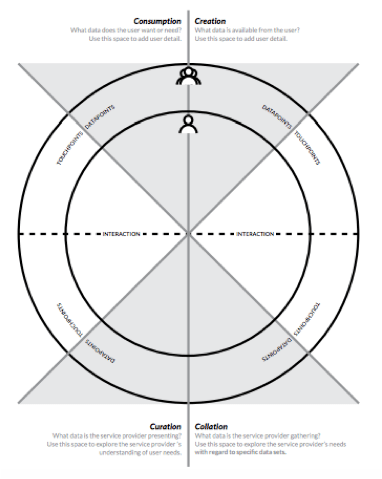 In each quadrant you think about the data points – what data is actually being collected or created during this flow – and you also think about touchpoints. This just means, what mechanism do you use to reach someone else, or for them to reach you? Is it a paper questionnaire about service satisfaction, a fault report via smartphone, a PDF map emailed to a colleague? 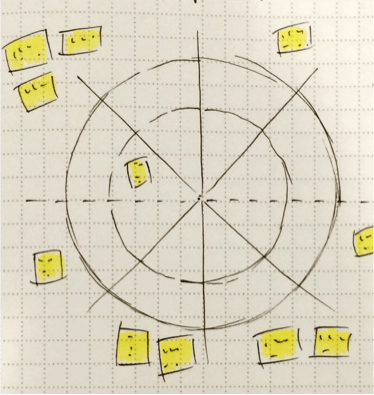 Whatever it is, you make a note of it and add it to the circle until you’ve been all the way round at least once. This way you cover not just data creation but also collation – how do you store it? what system do you use? then curation – what else do you do with it? do you give it extra meaning by linking it to another dataset, adding geographical data or timestamps, categorising it somehow? and finally you think about consumption – how do people get data or intelligence back out of your area? how do you share with people who might be interested, how do you visualise or communicate with people who need to know? This is what we managed to do in roughly 30 minutes at Blue Light Camp. In that 30 minutes we found out that, for instance, first responders to a major fire need up to date floor plans for any building they might have to enter, and these are usually paper copies. We heard that prisons and hospitals need to provide approximate numbers of inmates and inpatients in case there needs to be an evacuation, and the most efficient way to deal with that information exchange is a simple telephone call at the time of the incident. On the other hand there is a lot of data about event schedules, transport timetables, traffic flow and weather conditions that’s either already open or could be made so, that could be mashed up and used to keep people safe. We could have a model overlaid on the map showing potential traffic jams, higher than usual concentrations of people (football matches or concerts for example), and the chances of strong winds spreading a fire or heavy rain dispersing a chemical spill into rivers. In the category of “things I had no idea existed”, we also found out that the Food Standards Agency actually have predictive models for the impact of different pollutants on the food growing cycle, and can tell you whether you should grub up this year’s crop on your allotment and dispose of it after a major chemical incident. Of course it makes sense that we should be able to do that, but I had no idea this was a thing! This is why I love unconferences; the breadth and depth of experience and expertise in the room is always, ALWAYS, an eye opener.